ROBBIE Williams has been cheering up Joss Stone following an alleged plot to kidnap her. The Take That star is close friends with the British singer - after they performed together at the 2005 BRIT Awards - and after he heard the news that two men were allegedly planning to take her, he phoned her up and invited her backstage at the group's show in Cardiff, Wales. 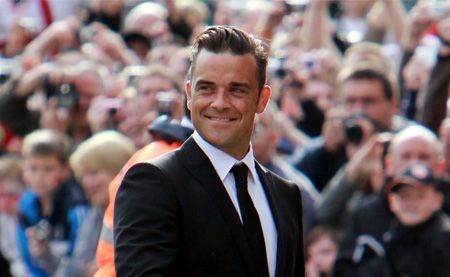 A source told The Sun newspaper: "Robbie and Joss have been mates for years. He got straight on the phone to see if she was OK and invited her to Wales. "She's still in shock but Robbie did his best to put a smile back on her face. His cheeky chappy side was in overdrive when they met up after the gig. "She was making light of it too, joking that it's been like an episode of 'Midsomer Murders'." Two men - Junior Bradshaw, 30, and Kevin Liverpool, 33 - were arrested earlier this week accused of conspiracy to rob and cause grievous bodily harm. While the alleged plot must have been terrifying for Joss, she was keen to reassure fans she is fine following the ordeal. She released a statement yesterday, saying: "I'd like to thank everyone for their concern but I'm absolutely fine and getting on with life as normal while the police continue with their inquiries."